Las Vegas, NV (April 5, 2017) – Arecont Vision®, the industry leader in IP-based megapixel camera technology, announces the introduction of a new series of megapixel cameras, the MicroBullet® family. 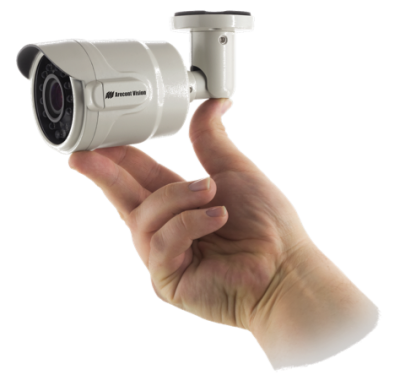 The MicroBullet is an extremely compact and affordable bullet-style camera, yet is loaded with advanced features developed by Arecont Vision. MicroBullet will be on display in the Arecont Vision booth, #8405, at the ISC West International Security Conference and Exposition, held in the Exhibit Hall at the Sands Expo, Las Vegas, Nevada, April 5 – 7, 2017. The tiny MicroBullet with its integrated adjustable 3-axis mount is a mere 6.8” (172.8mm) long and 2.8” (71.5mm) high. Available in 1080p or 3MP resolution, MicroBullet is ideal for low-profile indoor and outdoor surveillance use, featuring a die-cast aluminum, IK-10 impact resistant, and IP66 weather rated housing. All models offer rapid setup with a remote focus/zoom 2.8 – 8mm motorized lens. SNAPstream™ (Smart Noise Adaptation and Processing) technology reduces camera bandwidth consumption in all MicroBullet models without impacting image quality. MicroBullet is ideal for applications with normal to challenging lighting conditions, regardless of time of day. It offers true day/night functionality, with a mechanical IR cut filter and integrated IR LED illuminators. Wide Dynamic Range (WDR) up to 100db at full resolution is available on select models for use in applications with challenging or varied lighting conditions. Each MicroBullet camera offers remote focus capability to simplify set-up and significantly reduce installation time. Installers can simply install the camera on a wall, ceiling, or structure, then adjust the integrated 3-axis mount to point the sensor at the area to be covered. Once off the lift or ladder, the installer can select “Short Range Focus” or “Full Range Focus” for rapid setup from their computer, or they can adjust the focus and zoom as required by the scene. Arecont Vision cameras are designed to run an in-house developed, Massively Parallel Image Processing Architecture (MPIPA) on a Field Programmable Gate Array (FPGA) integrated circuit. All core features and technologies are developed by Arecont Vision, allowing installed cameras to be upgraded with new capabilities, thereby extending the useful life of the device. By employing the unique MPIPA architecture, Arecont Vision cameras do not require the use of common imbedded operating systems. This approach eliminates the risk of a cyber hacker repurposing an Arecont Vision camera for use in Distributed Denial of Service (DDoS), network penetration, ransomware, or other increasingly common cyberattacks. The MicroBullet series is ONVIF (Open Network Video Interface Forum) Series S compliant. Visit the Arecont Vision team at ISC West 2017, booth #8045, April 5 – 7, 2017, to see the new MicroBullet series and our award-winning megapixel cameras on display. Arecont Vision is the leading manufacturer of high-performance megapixel IP cameras. MegaVideo® and SurroundVideo® Massively Parallel Image Processing Architectures are now in their 5th generation and represent a drastic departure from traditional analog and network camera designs.